From medicine to Christmas plays, we separate the fact from the fiction. But how did it become so popular? The answer is part legend, part history. Peppermint was originally used not for candy, but for medicine. Dating all the way back to ancient Egypt, it was a cure for digestive issues, among other things. And in the early days, your pharmacist was also your candy maker. Things like peppermint and sugar would be mixed with medicine to mask its bad taste — think “a spoonful of sugar helps the medicine go down.” Eventually pharmacists started selling peppermint sticks and other treats at the local drug store. The first peppermint candy sticks bore little resemblance to today’s candy canes — they were straight and did not have red stripes. So how the modern candy cane come about? Here is where the legend overshadows history. We know that by the 1800s, Europeans decorated Christmas trees, but the edible decorations they used were nuts and cookies, not candies. A popular legend says a 17th century German choirmaster popularized holiday candy canes by handing them out to children during the Christmas Nativity play to keep them quiet. But myth busting website Snopes.com says there is no historical evidence to back up this story. Another story credits German immigrant August Imgard, who is reported to have decorated the first Christmas tree in America in 1847 with candy canes. So, what do we know? Bob McCormack is credited with popularizing the peppermint candy cane as we know it today. In 1919, McCormick started Famous Candy Company (later Bobs Candies) in Albany, Georgia. Advertisements from as early as the 1920s show the iconic red-striped candy cane, but no one has been able to trace the first time it was used. It is possible that the modern candy cane’s J-shape simply made it easier to hang from tree branches than other types of candy. Today, 90-percent of candy canes are sold between Thanksgiving and Christmas, and peppermint has become a holiday staple. So, tip your cap (and your milkshake) to whoever the person was who started the delicious holiday tradition. Think you know which city loves Peppermint Chocolate Chip Milkshakes the most? The holidays are best spent surrounded by those you love most – family, friends, or in this case, Chick-fil-A’s Peppermint Chocolate Chip Milkshakes. 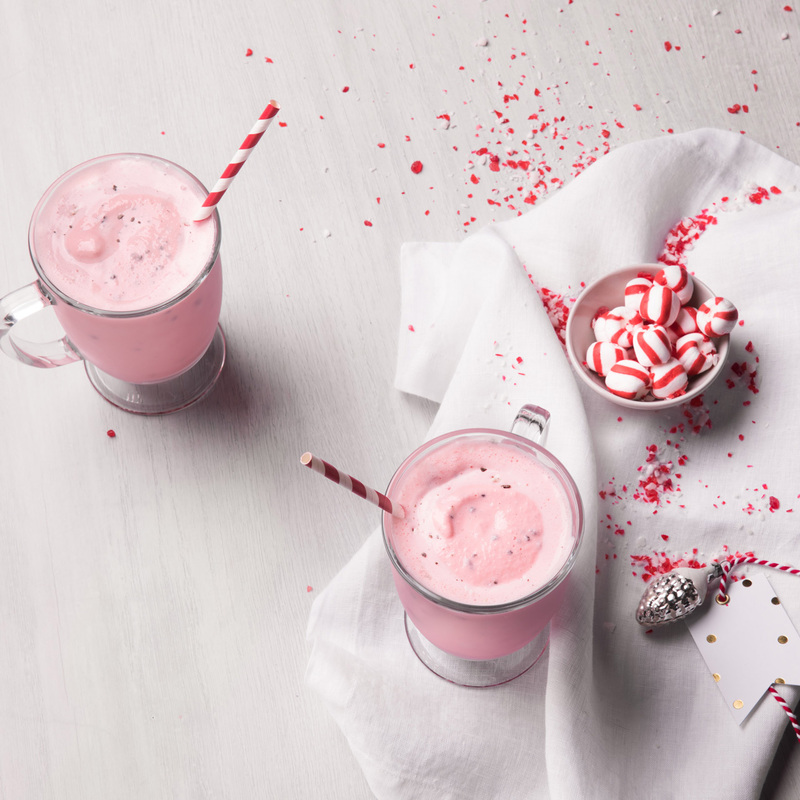 This seasonal shake is perfect for peppermint lovers and chocolate aficionados and a sure way to make the holiday season that much sweeter.